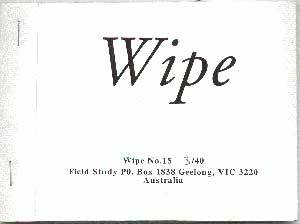 An ongoing Mail Art project of David Dellafiora in which Böhm participates among others is Wipe. Participants send 40 sheet of altered toilet paper to Dellafiora and receive a collection of 40 different works in return. 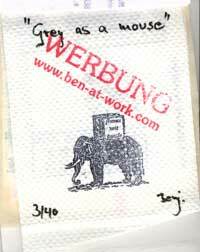 One of Böhm participation can be found in Wipe Nr.15, a little stamped work where Tolkien's poem Oliphaunt is used with the famous ZeitPuzzle-Elephant. The idea for the name of this review of Böhm's early work came from this rare piece of self-advertising.